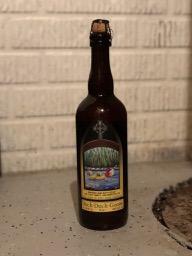 One bottle of Batch 2 Lost Abbey Duck Duck Gooze. Stored in a proper cellar since purchase direct from Lost Abbey. Shipment only to lower 48 continental US states. Paypal payments only please. Shipment promptly with 48 hours prior to Dec. 14.